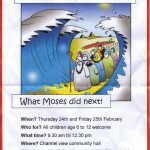 Holiday Club – What Moses did next! We are planning a Quiz night on Wed 16th Feb. I hear there may be some Brazil related questions!! Two people had this same verse on their minds on sunday.